The HL-550 plays like a dream and it's versatile enough to handle just about any licks you can throw at it. You don't have to play jazz on this excellent guitar but when you're ready to work some Wes Montgomery licks into your trick bag, you'll have the perfect tool for the job. The HL-550 sports mahogany top, back and sides. Hagstrom's HL-550 is so jazz, you'll be reaching for the Gauloises. The Hagstrom HL-550's playability is spot on, with a slim neck and 22 well-finished medium frets, while it's a good-looking guitar. 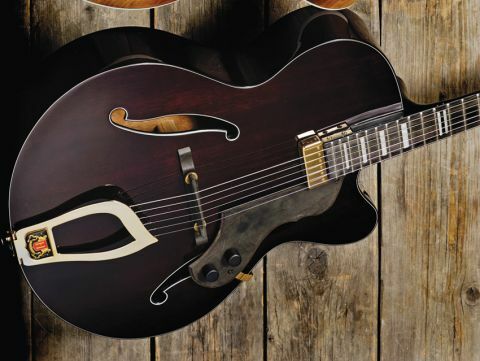 Unusually, Hagstrom has chosen mahogany for the body of the HL-550. The tonewoods are laminated for affordability, but it's a construction method that also provides strength and decent acoustic tone. "The HL-550 has a bright acoustic voice that's plenty loud enough for unplugged practice." Like all Hagstrom guitars, the HL-550 features a 'Resinator' fingerboard. This is a composite material with a feel and tone similar to ebony. The guitar's scratchplate is made from the same material. Aside from some rubbing off of the gold finish on the guitar's tailpiece, the scratchplate is the only thing about the HL-550 we don't like. It looks as if it was chiselled off a fossilised bat or something. If we're being shallow, we'd prefer a slightly more elegant Art Deco style plate to tie in with the guitar's beautiful tailpiece, headstock and machineheads. The HL-550 has a bright acoustic voice that's plenty loud enough for unplugged practice. Running the floating humbucker through the clean channel of your amp reveals a punchy tone. The Hagstrom pickup has a good output and the string balance is perfect. The HL-550 handles jazz licks, but you can pull off some beautiful jangly chords on it, too. Strumming chords and runs with your thumb, Wes Montgomery-style (which is not as easy as it sounds, we're afraid) sprinkles some sweetness on the guitar's tone. It just makes parting with it all the more traumatic for us. The Hagstrom reduces the smoothest distortion tones to speaker-shredded filth. Slip on a slide and drop the tuning and you'll be in Delta blues heaven. Jazz, blues, indie, country… this guitar is versatile as hell. We're always impressed with the quality of Hagstrom guitars. These guys seem to put tone and playability first, then they appear to spend the remaining lolly on the eye candy. That's the right way to do it in our opinion. Beauty has to be more than skin or finish deep.